Hopefully I can release 3 chapters a week soon…. and then I’ll get back into the regular schedule again. The Heavenly Demon Church began to make preparations to leave the moment the war ended. They had already retrieved the Moon Edge Blade Technique, completely decimated the army of the Alliance, and proved to everyone who the strongest in the continent was. They no longer had any reason to stay here. Gongson Chun Gi sent everyone except his private guards back to the Ten Thousand Great Mountains. And when he looked at the old man who came to visit him all the way from the Ten Thousand Great Mountains, he smiled. Sunwu Jo Duk. He was an old man who had a mysterious, powerful aura about him. When he saw the Pope, he immediately set to take a look at the various parts of the Pope’s body. After a while, the old man sighed in relief. Gongson Chun Gi stretched out his right arm. The Demon Doctor, Sunwu Jo Duk. That old man was the only one out of the eight guardians who sided with Gongson Chun Gi for peace. The others kept pestering Gongson Chun Gi about expanding into the mainland, but Sunwu Jo Duk was unexpectedly a person who enjoyed a peaceful, quiet life. And he also happened to be the person to know Gongson Chun Gi’s secret. The black bracelet around Gongson Chun Gi’s wrist. It was a seal that controlled the overflowing power of Gongson Chun Gi. Since Gongson Chun Gi forcefully deactivated it to destroy Baek Mu Ryang, it wouldn’t be strange if it broke now. Sunwu Jo Duk brought out the same type of bracelet in Gongson Chun Gi’s wrist from his sleeves, and put it on the Pope’s wrist. After that, he began to whisper some words. With a small vibration, Gongson Chun Gi felt pain akin to having his muscles compressed in one place. He frowned. No matter how many times he experienced this, he never managed to get used to it. This disgusting feeling of having his muscles being forcefully restricted. Gongson Chun Gi smirked. All the previous Popes of the Heavenly Demon Church suffered from the same condition as he. The Berserking Blood Effect. It was a side effect of the technique known as the “Shura Environment”, and the stronger the user of this technique got, the stronger the side effect got. Of course, Gongson Chun Gi, the one known as the strongest Pope in the history of the church, suffered from strong side effects. The side effects were so strong, that unless he used a seal on himself, even he couldn’t suppress it fully. Gongson Chun Gi, the strongest man in the world. If he were to go crazy, the world would turn into hell. After all, there would be no one that could stop him. Gongson Chun Gi complained while massaging his strengthless right arm. Sunwu Jo Duk looked at the complaining Pope before him, and smiled. Sunwu Jo Duk served the Pope ever since the Pope was a child. Therefore, he was able to see the immense amount of talent that Gongson Chun Gi possessed for a long time. But no matter how long he stayed with the Pope, he never managed to see a heir be chosen. There simply wasn’t anyone talented enough to inherit Gongson Chun Gi’s power. He thought that the Pope’s powerful technique would get lost after the Pope’s death, but what just happened? The Pope chose a heir. Didn’t that mean that the Pope managed to find a child with enough talent? As a person who loved the Heavenly Demon Church dearly, this news made him indescribably happy. Sunwu Jo Duk blinked a few times when he heard this. But he soon realized what the Pope was aiming to do, and opened his mouth with a serious face. The Heavenly Demon Church was a very religious group. In that group, the Pope was, in essence, god. That meant that he had to have the power to be able to prove it to the believers. In other words, a Pope of the Heavenly Demon Church needed tyrannical strength. The Pope needed a power that seemed to be unattainable by humans. That was the mission given to the one chosen by the representation of god. The tradition of the church. The tradition of the church was extremely important to the majority of the members. That naturally meant that if the Pope didn’t practice the Shura Environment, not many people were going to like him. Sunwu Jo Duk thought a bit. Was there any other martial technique that could rival the power of the Shura Environment? There wasn’t. Since the side effects of the Shura Environment seemed to trivial when compared to the actual power of the technique, the technique was passed on through the generations. When Sunwu Jo Duk thought that much, he suddenly realized something, and opened his mouth. Gongson Chun Gi grinned. It was a confident grin. Sunwu Jo Duk looked at that face of the Pope, and nodded. Gongson Chun Gi thought of his disciple while talking, then made a depressed expression. The Alliance was what held all the clans together, and its power rivaled that of the Shaolin temple. The Alliance’s power was so great, in fact, that many people commonly believed that the Alliance was more influential than the Shaolin temple. In other words, they were hard to fight. Gongson Chun Gi, thinking that, scratched his cheeks and spoke. Gongson Chun Gi said this, and at the same time commanded Lim Hak Gyum to bring Cho Ryu Hyang. He once again opened his mouth. A little while later, Cho Ryu Hyang stepped into the room. It seemed that he calmed down a bit after a few days had passed. But he still seemed a little unstable. Cho Ryu Hyang bowed politely to Sunwu Jo Duk, and opened his mouth. Sunwu Jo Duk observed Cho Ryu Hyang’s body with a face filled with joy and satisfaction. His instincts as a doctor had kicked in. After a moment, Sunwu Jo Duk tilted his head in wonder. Fa Mao Xi Sui was a technique that experts used for their disciples in order to make a disciple’s body be suited for training. It was extremely complicated, and used a lot of power, so it wasn’t easy to use. But the effects of the technique was truly amazing. It would essentially raise a person’s training speed exponentially. Once Sunwu Jo Duk got permission from the Pope, he obtained permission from the young lord, and grabbed the young lord’s wrist. When he tried putting in his energy into the young lord, he flinched. Sunwu Jo Duk looked at Cho Ryu Hyang strangely. He then looked at Gongson Chun Gi, and spoke. Gongson Chun Gi grinned joyfully. Only Cho Ryu Hyang, the subject of this conversation, didn’t know what was going on. The Bone-Changing Growth was something that only happened in the harmonious stage. That was why it was impossible for a young child like this to go through that growth. After all, a harmonious stage only happened once a person attained knowledge that would change their entire life. Just what was this? The young lord’s body was already in the best possible condition in order to learn martial arts. The joints in the body were extremely flexible, and the energy veins in the body weren’t clogged at all. The strangest thing lay with the dantian. There was something strange residing in it. Something small and round, and at the same time, hard. Something like that was just laying in the young lord’s dantian. That small sphere seemed to contain an immeasurable amount of energy. Cho Ryu Hyang scratched his cheeks. What should he say? 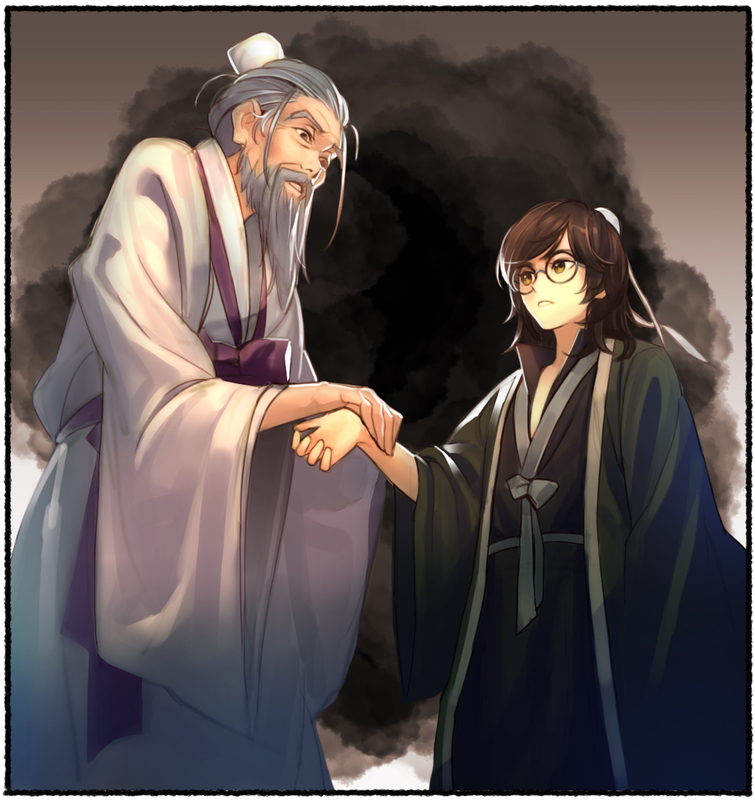 Should he reveal the existence of Zhuge Liang? Was that alright? Gongson Chun Gi realized a long time ago that this boy was hiding something other than mathematics. That was because Gongson Chun Gi’s eyes could easily perceive things of that sort. But he still pretended to not know about it. After all, everyone has a secret they want to keep. Gongson Chun Gi wasn’t selfish enough to try to force the secret out of his disciple. He simply believed that the boy would naturally come to tell him about it in the future. Cho Ryu Hyang’s eyes turned bright when he heard this. He could finally learn martial arts. He had to take revenge for his teacher as soon as he could. That was the only way he could calm his tormented heart. Gongson Chun Gi took something out of his sleeve, and threw it at Cho Ryu Hyang. That thing landed directly on Cho Ryu Hyang’s open palms. Gongson Chun Gi opened his mouth towards his dazed disciple. Cho Ryu Hyang stared at the book in his hands. This was the first meeting between Cho Ryu Hyang and Ak Jung Pae. A meeting that transcended a hundred years. Okay, this is extremely awesome!!!! Thanks so much for all your hard work!!!!!! i really wish…you’d come back to your previous speed….!!! it’d be awesome if that happens…. ps: i have a question…… is there any romance in this novel….??? just take it easy don’t rush things it will only end badly in the long run..